I decided to do a pictorial of the events that shaped my life this past decade. If you have trouble reading the captions, click on the photo to see them enlarged. As I was crafting this post, I noticed that I now have 92 followers...only 8 more to go to complete my challenge and giveaway! Wouldn't it be spectacular if I was able to get 100 followers and award the prize package today?! Help me get 8 more followers...tell your friends to join Marlie and Me in 2010. Happy New Decade!!! Stopping by from SITS! I love the photo collage. Such a creative and wonderful idea! Enjoy 2010! Love the flashbacks, adorable way to put it! Love the pictures! It's amazing how much our lives change and the things we do in a decade. We got married in 2000 as well. Wow! This is great!! Happy New Year! I'm very sorry for the delay in coming to say hello, but wanted to thank you for swinging by my blog on Monday for my SITS day. Hope you have a very happy new year! Wow! Cool graphical-type stuff! What was your first blog about? That wasn't your pregnancy blog right? Happy New Year! Thanks everyone for the compliments on this post! Graphic design/desktop publishing is one of my hobbies. @ Maureen: my first blog was a personal journal called Pieces of Reese (my childhood nickname). It lasted exactly one post. LOL! 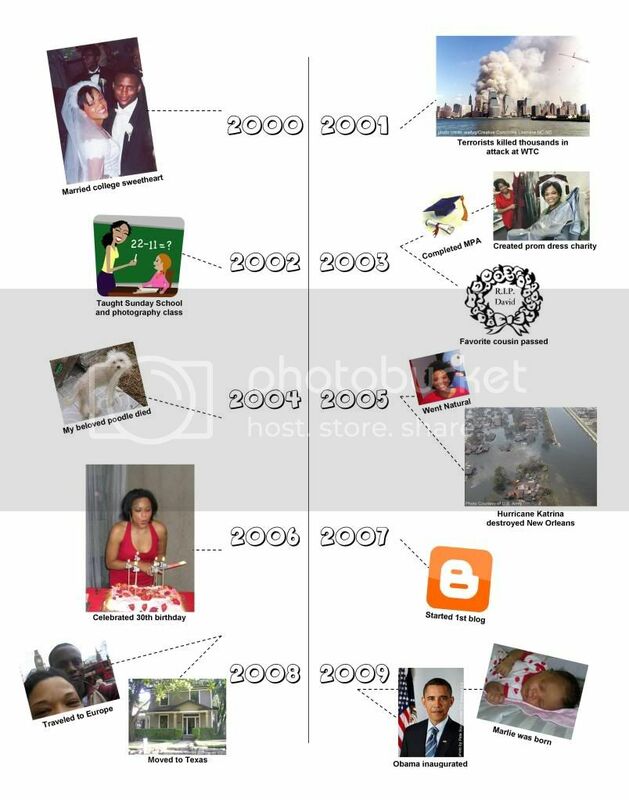 Your pictorial is SO cool- its amazing to look back and see how much life happens in 10 years. Thanks for visiting my blog for SITS Saturday! Your blog is really cute! I love your timeline! Great idea! Teresha, loved your flash backs!. Sorry, for being late in comments.Too many things to do lately.